Home » Familiarisation Trips » Malaysia » Malaysia: Hey, Bohey Dulang! I'm in Love! We checked out of our hotel in Semporna, Sabah soon after breakfast and left for the nearby area where there are many chalets that house travel agencies that offer trips around Semporna, the islands and beyond. There we went into SMP Tours & Travel Sdn. Bhd. “office” for our first island hopping trip. Now, Semporna is a popular destination in Sabah mostly for its naturally beautiful and unspoilt islands, with their long stretches of sandy beaches and amazing underwater world. Our first island hopping trip was to bring us to 3 of these islands and our first island would be Bohey Dulang. I was very excited by this as I have always wondered if Bohey Dulang is really as beautiful as it appears on all those picture-perfect postcards and probably “heavily filtered” Instagram photos. I was going to find this out soon. We left the jetty in Semporna at around 9 and by 10 a.m., we arrived at Tatagan Island for a quick stop and some photo opportunities of the Bajau Laut - sea-gypsies - who live in stilted huts in their water village right in the middle of the sea. I’ve seen many photos of these, some are beautifully shot but I still do not feel comfortable with the common practise among tourists that hand out food and snacks to the Bajau Laut kids. As expected, the moment our boat arrived at their water village, scores of sampans – “captained” by kids - started to come over for some handouts. Despite the feeling, I have to admit that they do make perfect photo subjects. We were at the water village probably for less than 10 minutes before continuing with our journey to Bohey Dulang. On the way, there’s a security check by Eastern Sabah Security Command (ESSCOM) (in the middle of the sea) where our boat crew had to submit details of the boat and its passengers. I was actually surprised by this (as I didn’t expect it to be done in the middle of the sea) but considering what has happened in the area in the past, it is very comforting rather than nerve-racking. Our boat docked at the jetty at Bohey Dulang at around 10.30, 1.5 hours after we left Semporna and already I was falling in love with the crystal clear water, the corals and the whole view I just couldn’t stop clicking on my camera. The view was just pure crazy and it felt like totally out of this world. I couldn't believe I was actually in Malaysia. I was in a dream. A beautiful one. Once we reached the island after walking along the wooden jetty, there was a safety briefing about the trek up the hill by our guide. The trek is just 600m in distance but there are places where it is quite steep and there’re places where it’s almost flat. Or so we were told. I thought that’s not bad, should be manageable for this not so fit guy. And so we started with our trekking. There is a signboard (with an emoji!) at every 100m checkpoint. I'm not sure if this is a good thing or a bad thing. It's not fun when you've just started your trekking and you're already feeling a little bit breathless when you saw that there is still some 500m or 400m to go to the top! The last 100m, however, was pretty easy. The moment you arrived at the top after some 45-minute trek, you’d forget everything. The tiredness. The breathlessness. Every single thing. If the view down at the jetty was out of this world, I have no idea how else to describe the view from up above Bohey Dulang. It just left me speechless. And deeply in love with the place. Bohey Dulang is just naturally picture perfect. And definitely, doesn’t need any filter. Bohey Dulang is certainly one of those places. Except that now I don’t want to be here and enjoy the view just once. I want to return again and again and again. Because hey, Bohey Dulang! I’m in love! We flew with Malaysia Airlines from Kuala Lumpur to Tawau in Sabah. The airline flies twice daily on the route while AirAsia, a low-cost airline, flies 5 times daily along the same route. The latter now also flies from Johor Bahru. And while on the way there, don't forget to check out the Top Things to Do & See in Tawau! Semoga bisa kesana sutu saat nanti, Malaysia memang punya segalanya. Fuh waterfall! Someone told me on Instagram that there is also a well somewhere along/near the trek up the hill. Didn't see any though. What gorgoeous views! Definitely no IG filters needed. This part of Malayasia seems perfect for a day (or days) of island hopping. Also great to know Air Asia flys there 5x a day. It makes it an accessible destination from points in SE Asia. We spent 2 days island hopping, snorkelling and diving whilst staying 2 nights at a resort in the middle of the sea. Also spent another day travelling around the nearby towns like Tawau and Semporna. It was just perfect! Tawau (the main airport town for Bohey Dulang) is quite accessible from the capital city, Kuala Lumpur. There are also direct flights from Johor Bharu, which is the nearest Malaysian city to Singapore. Wow, what a gorgeous destination! That clear water looks so tempting, I could swim in it right now. Looking forward to visiting Malayasia one day soon. The views from the top definitely make that breathless trek worth it! I find that when I'm not used to the heat and humidity in places like this, the trek is just more difficult. I've done much longer and harder treks, yet the heat can make it so much tougher. It's really worth it! Having seen photos of the views from the top of the hill was what kept me going despite the humidity. So glad I didn't give up! I'm looking at a trip to Malaysia later this year and these are exactly the views I want to see.I'm with you regarding handouts to the kids but I imagine opportunities for them are few. I imagine the same thing too especially when they are mostly not recognised as citizens of any country as they live at sea. But anyways, if you're coming to Malaysia towards the end of the year, I'd totally recommend Sabah. The view from the top looks amazing. I would say it was worth it, no matter how steep the "almost flat" trail was. Of course you know, if it were really flat you wouldn't have had that view. You're totally right! :D The view makes it worth it. 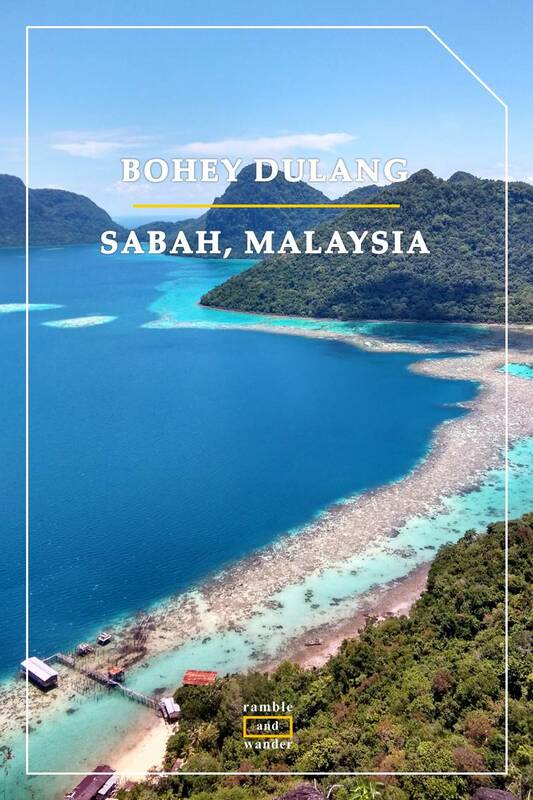 Bohey Dulang looks absolutely gorgeous. It turned out to be a great reward after that 600m hike for you :) Personally I don't like sign boards that reminds me of the distance that I'm yet cover lol! I'm in love with Bohey Dulang from looking at the beautiful photos you posted on instagram! I've yet to go to Malaysia but this particular part of the country looks so perfect and calming. It must be so wonderful for locals to wake up every morning with that view, I think us lot dwelling in the city are too stressed out haha! Bohey Dulang is actually an island and it's not inhabited apart from some security personnel, I think. But yes, if I were to live in the nearest town, I'd probably take a boat and come here so often to get away from it all. 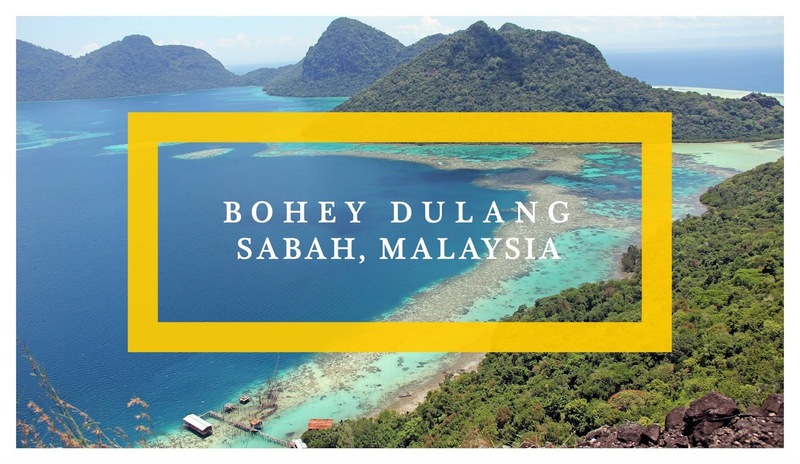 I haven't been to Borneo Island or in this case, Bohey Dulang and of course, I will go there soon! It looks like pretty untouched location offering so much purity and peace. I don't know how they do it, keeping the place untouched when it's a popular island destination. I think it's probably because they limit the number of daily visitors to the island. The place looks oh so pristine!